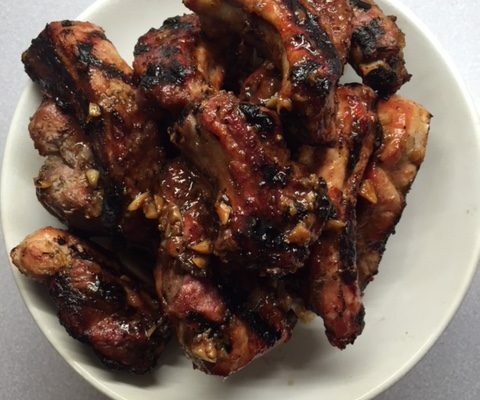 This is party food folks, perfect for entertaining a crowd and easy peasy because you marinate the ribs ahead and then pop them on the grill. Of course if you don’t have a crowd just halve the recipe and its a great weekend dinner or part of an appetizer selection. Either way you can’t imagine how good these are until you try them. Let me know how they turn out! In a large oblong pan combine all the ingredients and stir the ribs to coat evenly. Cover and refrigerate overnight or a minimum of 2 hours. Heat the oven to 350. Place the ribs with the marinade on a foil lined baking sheet and roast for 30 minutes until tender. Heat a grill or broiler. Grill the ribs until golden brown, about 5 minutes on each side. Serve with lime wedges.